1. Bantry. Cross shaft. Close up of West Face, panel W2. 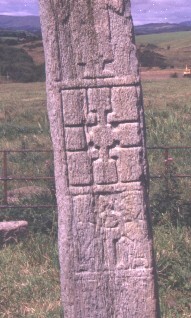 This cross shaft is situated within a railed off area on a monastic site at Kilnaruane near Bantry. Its measurements are 2.15m high 30 cm wide at end, and 20 cm thick. E1 Jesus calms the storm. New Testament. Luke 8.24. W1 Ss Paul and Anthony breaking bread in the desert. This is a close up of the west face of the monument which show the panel W2. A cross is depicted with square terminals and square at its centre.